The best sixty bucks a vinyl lover can spend. I reviewed the wonderful Nitty Gritty 2.5FI-XP record cleaning machine ($899) in the December 2009 edition of Enjoy the Music.com. I loved it, and would have kept it but both of our cars have required some rather expensive repairs. A couple of weeks ago I happened to see the Spin-Clean Record Washer System featured on the daily industry news portion of Enjoy The Music.com. Saw the price and what the system comprised of: a bright yellow plastic container that the record is placed within that holds the cleaning solution, a pair of hard plastic rollers, and a pair of cleaning pads. The record is placed between the pads and rotated by hand to clean it, then dried by using the included drying cloths. Sixty bucks? Are you kidding? It can't be true. 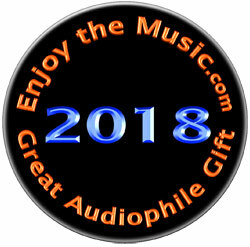 I did a Google search and found a great thread over at the Audio Karma discussion board. The guys over there seemed totally stoked, so I made arrangements for a review sample. The Spin-Clean unit has been in production since 1968. Besides its economy, there are a few things that differentiate the Spin-Clean from its competition. First, the unit requires no power as everything is done by hand. Second, because the record is inserted between two tight fitting cleaning pads and submerged in the cleaning solution, both sides of the record are scrubbed simultaneously. To me, the most important part of the system is the Spin-Clean Washer fluid, which has already become my favorite solution for cleaning vinyl. It is a concentrate, designed to be mixed with distilled water in the Spin-Clean unit, and is the least expensive cleaning solution that I am aware of. The fluid appears to be a very mild cleaner to dislodge the dirt from the groves, along with a flocculent, which causes the dislodged dirt to fall to the bottom of the Spin Clean, where it remains so that the next record is not contaminated by the dirt from the previous record. When the record is removed, it is dried by hand with the supplied lint free drying cloths. A couple of other things to point out: first, the Spin-Clean can clean records of all diameters from 7 inch singles to 12 inch LPs. The unit is bright yellow for a reason: it allows one to see the amount of crud that has been removed from the grooves, as the dirt will rest at the bottom of the Spin-Clean Unit. 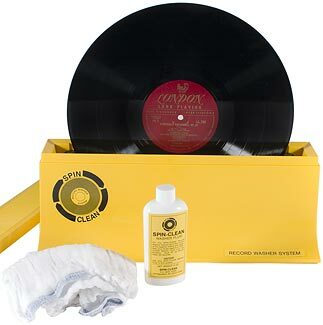 Spin-Clean states that each batch of cleaning fluid can clean up to 50 records. Because very little of the cleaning solution is used along with the distilled water, the four ounce bottle will clean hundreds of LPs. The Spin-Clean system works exactly as advertised. To test its effectiveness, I decided to re clean some records that had been cleaned on the Nitty Gritty 2.5FI-XP. Lo and behold, the first LP yielded, well, stuff that was still embedded in the grooves after a machine cleaning. It was right there in the bottom of the Spin-Clean. There was no denying it. Off to the turntable I went, and before the music started I could hear it. Nothing. The record didn't have surface noise before a bath in the Spin-Clean, and yet the truth was undeniable- the record was even quieter after using the Spin-Clean. The Spin-Clean instructions recommend that records be cleaned in batches, so that's what I did. I went into a cleaning frenzy. I took a few breaks, drank some orange juice, listened to an album side, and went right back to cleaning. Everything I listened to, from a clean garage sale copy of the original soundtrack to The Sound of Music (that I bought for a dollar) to some mint Deutsche Grammophon classical LPs purchased in the mid 80's sounded superb. All of the records I cleaned with the Spin-Clean, save two garage sale finds, had been previously cleaned either with the Disc Doctor Fluid and brushes and my KAB EV1 or the Nitty Gritty 2.5FIXP. Without exception, the Spin-Clean Record Washer System removed additional dirt from the grooves. While all of the pre cleaned LPs looked and sounded good before a bath in the Spin-Clean, they all looked and sounded even better afterwards. I saw (and heard) no differences between the LPs that had been previously cleaned and the two that had not once they had been bathed in the Spin-Clean: they all seemed equally clean. Although the Spin Clean instructions state that 3 spins and a dry are all that are required to end up with a clean LP, I have taken to 7 to 8 spins and cleaning the LPs twice. Necessary? Probably not, but I feel better that way. The worst thing that will happen is that I will end up buying more replacement supplies from Spin-Clean. I am sure that Mark Mawhinney (the head honcho at Spin-Clean) won't mind. Like the system itself, the replacement supplies are very reasonably priced. I also counted -- I am averaging thirteen albums per batch of cleaning fluid. Even though the dirt falls to the bottom of the unit, I get to a point where it bugs me, so I change the fluid and clean out the bottom of the unit with a paper towel. Even at that rate, the fluid is still extremely economical compared to all of the other "audiophile approved" cleaning concoctions. One last observation: I use an Audio Quest dry brush (you know the one with the silver handle and reportedly a "million" soft bristles) to remove any surface dust just before playing. After using the Spin-Clean, I feel much less friction with the Audio Quest brush. Less friction equals less record and stylus wear. That alone makes the Spin-Clean worth far more than sixty dollars. Many of you will already own a vacuum machine. As I said before, I own a KAB EV1. ($159) The KAB is a Nitty Gritty unit that gets its vacuum from a home vacuum cleaner. It dawned on me early on that a quicker, more efficient way of removing the cleaning solution from the LP would be to vacuum the LP with the EV1. It is quicker and easier, and records cleaned with the Spin Clean seem cleaner than those cleaned by hand with the supplied drying cloths. Sure, it requires two units this way, and it is noisier due to the vacuum cleaner, but at the end of the day, this is how I plan to clean my records from this point forward. The Spin-Clean cloths are still quite useful for removing the last bit of moisture that the KAB tends to leave behind on the outer edge of the LP. How easy is it? Counting the extra spins on the cleaning step and two cleaning/drying cycles, I can clean an LP in just over three minutes- 3:06 to be exact- and I was not rushing. As the subtitle states, the Spin-Clean Record Washer system is the best $80 one can spend to care for their LPs and enrich their listening enjoyment. Combine it with the KAB EV1, and one can have the excellent cleaning from the Spin-Clean and the ease of a vacuum system for less than $250. 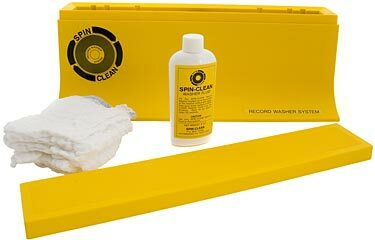 Either way, the Spin Clean Record Washer System is an insane value. It gets my heartiest recommendation. Price: $79.99 for basic unit, $124.99 for complete system.